The IAPAM (International Association for Physicians in Aesthetic Medicine), in consultation with its members and associated industry experts, has compiled its list of the top anti-aging trends in aesthetic medicine for 2015. As the US population ages, we continue to see growth of minimally-invasive procedures over surgical options. 2015 promises to be a year that will help many Americans age gracefully, and hide those dreaded bulges! “In the last 9 years, we have seen consistent growth with many of the tried and true aesthetic procedures like Botox Cosmetic®, but its nice to see some new additions to this years Aesthetic Medicine trends,” says IAPAM executive-director, Jeff Russell. With the ever-advancing area of cosmetic medicine, it is hard to know what’s hot and what’s not. Newer procedures have now emerged that offer safe and effective treatments to individuals seeking them. But these procedures are not just aimed at improving the cosmetic appearance of the person; cosmetic procedures initially started as medical therapies that have now expanded their applications, for example, the Botox® injection. Not only is it used in treating fine lines and wrinkles, it is an excellent treatment for a condition of the eye called blepharospasm. In 2014, there was quite a shift in the types of procedures sought after by patients. The number of non-surgical procedures in their entirety was higher by 13.1%! Hair removal procedures increased 2%, while microdermabrasion procedures dropped nearly 4%. Here, we look at what we think the world of non-invasive cosmetic procedures will see in 2015. Our face says a lot about us – our expressions (and even ‘microexpressions’!) can say a lot about what we think and how we feel. Tiny imperfections can become more and more prominent as we get older, and nipping them in the bud can be the solution for preventing them from being a problem in the future. Interestingly, and contrary to popular belief, men seem to be seeking Botox® injection procedures a lot more. In 2015, this trend is likely to rise even further. Statistics have shown that Botox® injections went up by 15.6% in 2013.There does not appear to be any predilection towards race in the trends; white Caucasian, Hispanics and African Americans all seem to be seeking these injections. Reasons are many, but mostly relate to dating, work/profession and just a need to feel and look young. We should also mention a new arrival to the Botulinum Toxin arena, Xeomin by Merz Aesthetics. 2. Dermal fillers – The likely winner? Over the years, hyaluronic acid dermal fillers have become more and more sought after. Since 2012, there has been a marked rise. The primary reason for this is the emerging awareness of the importance of one’s external appearance, with unsightly crow’s feet and forehead wrinkles possibly making one look older than they actually are. Dermal fillers can offer an easy solution to looking younger, shaving off years in an individual’s appearance just by giving them a more defined and smoother facial contour. One possible reason for this is that people now see more and more of themselves on online video chat windows. Along with this, an increased requirement to look good and professional at work can prompt one to seek hyaluronic acid fillers. Hyaluronic acid dermal fillers are close contenders in the race to being the top non invasive cosmetic procedure in 2015. 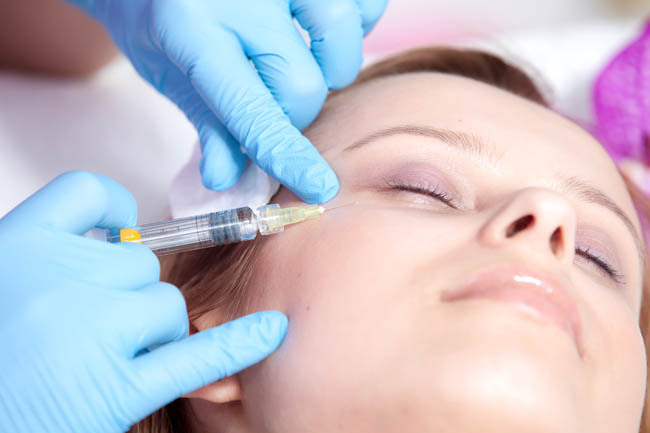 Popular hyaluronic acid fillers include Allergan’s Juvederm and Voluma, and Merz’s Boletero. Intense photo rejuvenation is a process where light is used to rejuvenate skin. The results are stunning, and are comparable or even better than chemical peels and surgical treatments. Last year saw an increase in IPL procedures reaching 456,613 procedures – a whopping increase over 35%, which is a remarkable rise! A primary reason for this rise is that people now realize the positive results that they can see with IPL treatments. With ease of access, great deal of safety and excellent outcomes; there is no doubt that IPL photo rejuvenation procedures will continue to remain popular in the year ahead. Physicians looking to meet the demands of this growing trend are encouraged to add IPL photo rejuvenation to their existing or new practice. “With a plethora of aesthetic devices to choose from, many successful medical spas open for business with only an IPL–a great choice for your first device, or to add to the skin treatments on your menu of services” says Michael Sparks, QuantaUSA. Obesity is a common problem worldwide, and is accompanied by multiple health problems such as heart disease, stroke and diabetes. In this day and age where looks can sometimes define how we take care of ourselves, losing weight has become essential. Diet and exercise can help most of the time, but stubborn fat can be exactly that – stubborn. Removing stubborn fat can be achieved through non-surgical fat removal and cellulite treatment techniques. Cool Sculpting, QuantaShape, Liposonix are all technologies that have emerged as safe and effective treatments in removing excess body fat or the appearance of cellulite. Radiofrequency wave treatments – called Vanquish RF, recently made news at the 2014 Aesthetics Meeting as an excellent procedure to remove fat without causing any discomfort to the patient. It is therefore no surprise that these new technologies have resulted in a 23.9% rise in the performance of non surgical fat reduction procedures. Many individuals who seek tattoos do so either in their young age, due to peer pressure or just because it was a part of societal culture at the time. However, as time passes, the same individuals regret getting them due to professional reasons. Having unsightly tattoos on exposed parts of the body are not looked upon as being professional, prompting the person to get them removed. In fact, even the military now frowns upon having tattoos. “During 2013, the number of tattoo removals grew by 52 percent, with nearly 100,000 procedures performed, according to a report by Detroit’s WWJ-TV. The Boston Business Journal estimates that the rate of those with tattoos who have one they’d like to modify has reached 20 to 40 percent. This means that removal services may already have up to 20 million potential clients” advises Michael Sparks, QuantaUSA. For these very reasons, tattoo removals have become hugely popular in the recent years. The process is simple, and involves removal of the different colors using different wavelengths of light (laser). In 2013, over 45000 tattoo removal procedures were performed – an increase by 11%. This number is continuing to rise, and will do so in 2015 as well. In conclusion, it is interesting to note that non-invasive aesthetic procedures have continued a strong growth pattern over the last 10 years, even through the recession. Now with a stronger economy, 2015 will no doubt be a year that will see significant growth. Physicians are encouraged to ensure they are properly trained and positioned for success in the aesthetic medicine industry. The IAPAM is offering physicians wanting to learn more about Botox® training a free eBook titled “Botox Injection Best Practices.” For more information on the Top 5 minimally invasive procedures and medical weight management, including all the ins and outs of adding these procedures to your new or existing practice please visit www.aestheticmedicinesymposium.com. Note: Botox, Voluma and Juvederm are registered trademarks of Allergan, Inc. Xeomin and Boletero are registered trademarks of Merz Pharmaceuticals. Statistics: ASPS (American Society of Plastic Surgeons) and ASAPS (American Society of Aesthetic Plastic Surgeons).